If any of you have been to a Chinese restaurant, you have most likely seen this Wonton dish. It’s delicious! Often it is served in the form of a soup, with some vegetables and or noodles also in the broth. 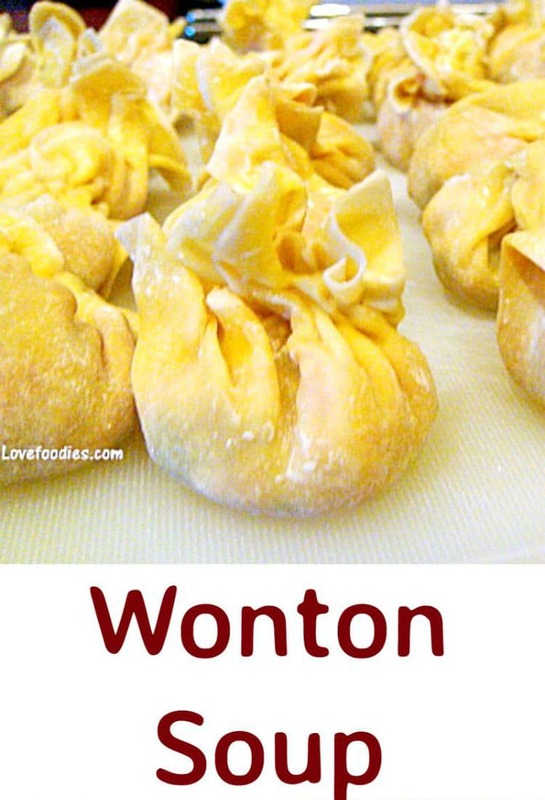 There are many ways to cook wonton, and there are also many fillings you can use. Here, I will show you my favourite fillings, and I choose these because of the flavours and texture sensations you get. The combination of the ingredients I use gives for a wonderful aromatic and fresh tasting wonton, and when you bite into the wonton itself, first you get the soft pastry, (think of ravioli or similar), then the filling presents you with a mixture of soft from the meat, and a gentle crunch from the bamboo shoots or water chestnuts. You then get a slight chewy texture from the Chinese mushrooms, and that’s just the texture sensations! As for the flavours, well, the fresh hit of ginger, mixed with the distinct taste of those Chinese mushrooms, combined with all the marinade, and the Chinese Wine coming through, this whole dish makes for a truly delightful eat! 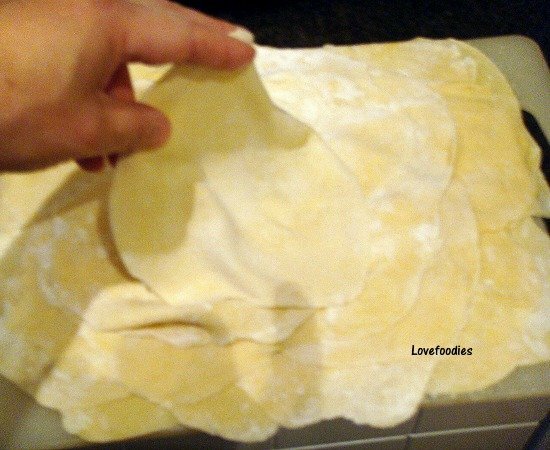 Regarding the wonton pastry / wrappers, I have also made my own pastry from scratch, as you can see in the photo. I do this sometimes when I can’t get to the shop to buy the wrappers. However, given the time involved in making the wrappers, and the precision you need in rolling and shaping, I would advise to buy the wrappers from the shop. They are better than my home made wrappers that’s for sure! You may think, when you see this makes 50 wonton, it will take you forever to make them. I timed myself and it took just under 15 minutes to fill and shape them all. So don’t be overwhelmed at the thought, be methodical and have everything you need in front of you. Take a seat and just fill and shape! The marinade combination I use is not salty, but if you wish for a saltier flavour you can add an extra dash of soy sauce when you have served the dish. It’s always a personal preference as to how much soy sauce you add to a recipe, but I don’t like salty food, so I always add less and then people can help themselves later if they wish. 1. Get all your ingredients prepared and ready before you start cooking anything. 2. Be creative! if you don’t have or can’t find some of the ingredients, choose for something similar which will give you flavour, colour and texture. 3. Allow for between 6 – 10 wonton per person, depending on appetite. 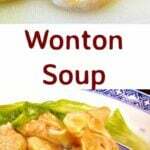 I usually find 8 wonton in my soup is enough for me as a main meal. ***** If you can’t get these, use 1/2 medium carrot peeled and finely chopped into matchstick width cubes. 1. First off is to soak the Chinese Mushrooms in hot water. This will take around 1 hour for the mushrooms to soften. (I usually do this over night). Save the water from the mushrooms. We will use it later. 2. 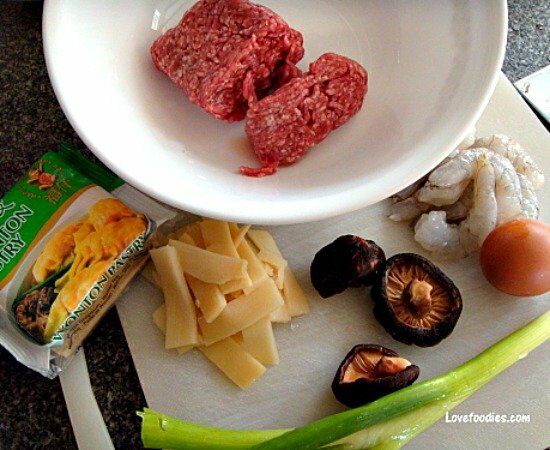 Prepare all the ingredients, so start with the ground meat. If it is coarse cut, chop it a little more so it is fine, then transfer to a bowl. 3. Finely chop all the other ingredients for the wonton filling and add to the bowl. For the shrimp, be sure to remove the shell, de vein and then chop into pieces about the size of a garden pea. 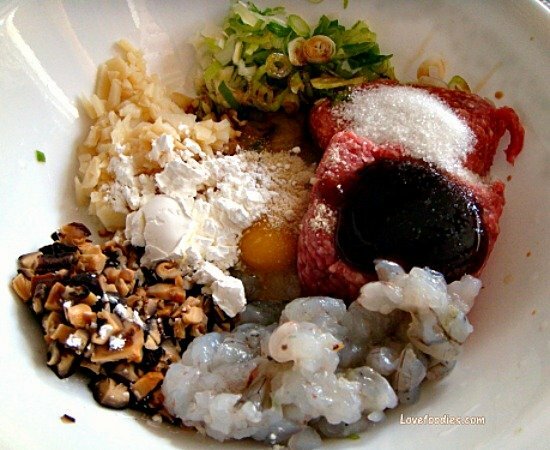 You can see from the photo below, all the filling ingredients are prepared and in the bowl. Now you add the marinade ingredients to the bowl. 4. Take a spoon and combine very well. 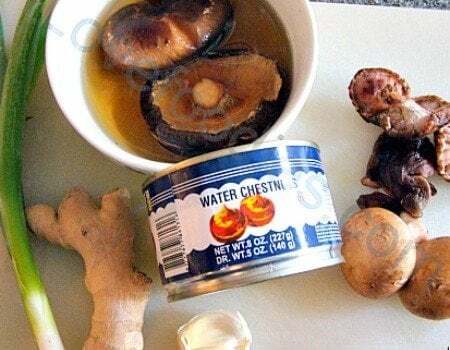 Then add 2 Tablespoons of the mushroom water, or cold water if you didn’t use Chinese mushrooms. Combine everything. I always stir everything together for around 2 – 3 minutes constantly. Then cover and chill for 20 minutes. 5. Take a small bowl and fill with cold water. This will be used to seal the wonton parcels. 6. Take one wonton wrapper (be sure it is one only as they sometimes stick together!) and place it on the palm of your hand so when you look at it, there is a pointy side at 12 o’clock and a point at 6 o’clock, like a diamond. 7. Use your finger, dip in the bowl of cold water, then run it along all the sides of the wrapper. 8. Just before you use the filling, give it a good stir since it’s been marinading. then use a teaspoon and place some filling in the centre of the pastry like the photo. 9. Take the bottom point of the pastry (the 6 o’clock pointy end) and take it up to the top pointy (where my thumb is in the photo). Then seal all along the edges, making sure you get any air out. 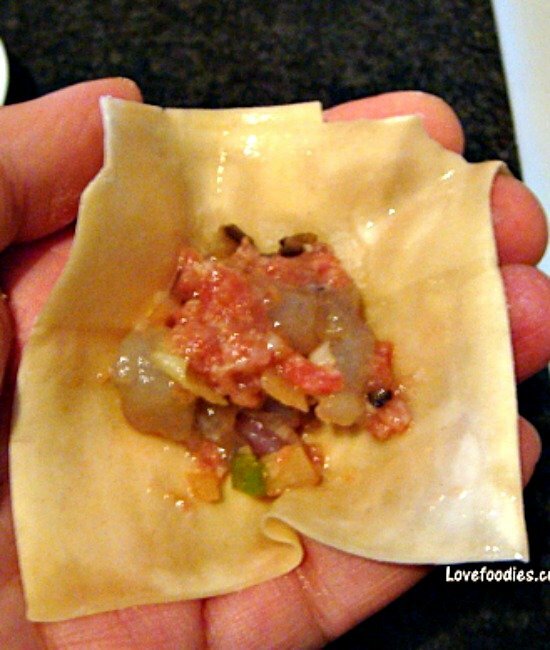 As you seal the edges, crimp a little along the way so the wonton looks like the photo below. 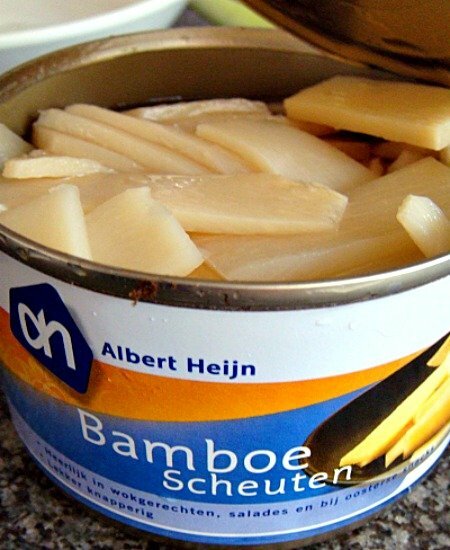 You can make different shapes, but for me, this is the easiest and one that seems to not open up in the broth! *** Be sure the edges are all sealed otherwise the fillings will come out when you cook them. 10. When you have made the wonton, place on a floured surface, or chopping board like I do, and continue making them until you’re done! ******* It is at this point, you can freeze the wonton. I place then on a floured sheet of parchment, then fold over the paper and place in a zip bag. They freeze very well. You can then cook from frozen or defrost and cook as the instructions below. 11. 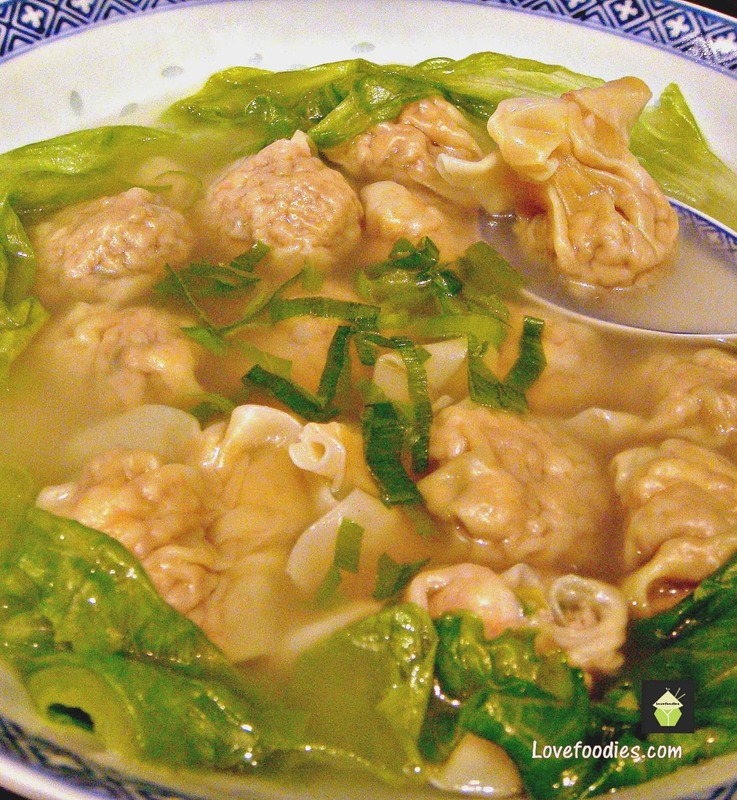 In a large pan, fill with boiling water then using a slotted spoon, place the wonton gently in the water. Try not to move them around in the water in case you break them. When they float to the top, they are cooked. Transfer them to the serving bowls. Discard the water as it will be very cloudy and starchy. 12. Now to make the broth, simply add your chosen broth to a pan, and bring to the boil. 13. Whilst waiting for the broth to boil, separate the Iceberg lettuce leaves. I do this my cutting the core off and running under a cold tap. The leaves come away very easy then. 14. Add the sesame oil and a dash of soy sauce if you wish to the broth, then add the lettuce leaves. Stir everything, and you will find the leaves soften and the broth is ready. 15. Take the lettuce out and arrange in the soup bowls, I did mine around the edge of the bowl with the wonton sitting in the middle! 16. Use a ladle and add the broth to the wonton, sprinkle with some scallions, cilantro, if you wish and serve! You can also add some dashes of oyster sauce or soy sauce on the top, whatever you like! If any of you have been to a Chinese restaurant, you have most likely seen this Wonton dish. It's delicious! Often it is served in the form of a soup, with some vegetables and or noodles also in the broth. Here, I will show you my favourite fillings, and I choose these because of the flavours and texture sensations you get. 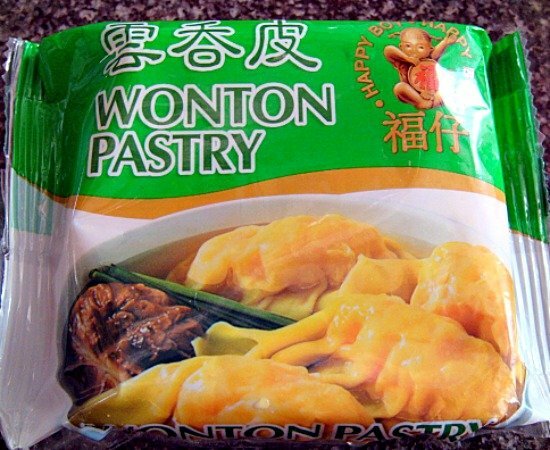 The combination of the ingredients I use gives for a wonderful aromatic and fresh tasting wonton, and when you bite into the wonton itself, first you get the soft pastry, (think of ravioli or similar), then the filling presents you with a mixture of soft from the meat, and a gentle crunch from the bamboo shoots or water chestnuts. 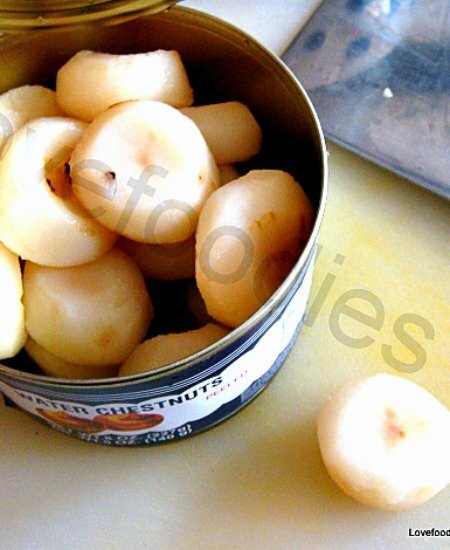 You then get a slight chewy texture from the Chinese mushrooms, and that's just the texture sensations! t ***** If you can' get these use 1/2 medium carrot peeled and finely chopped into matchstick width cubes. Prepare the filling. First off is to soak the Chinese Mushrooms in hot water. This will take around 1 hour for the mushrooms to soften. (I usually do this over night). Save the water from the mushrooms. We will use it later. 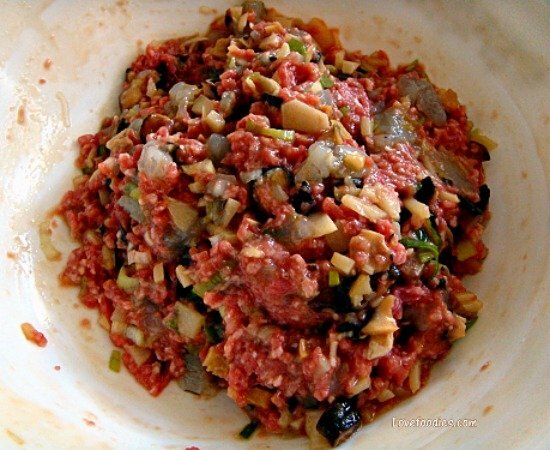 Prepare all the ingredients, so start with the ground meat. If it is coarse cut, chop it a little more so it is fine, then transfer to a bowl. Finely chop all the other ingredients for the wonton filling and add to the bowl. For the shrimp, be sure to remove the shell, de vein and then chop into pieces about the size of a garden pea. Take a spoon and combine very well. Then add 2 Tablespoons of the mushroom water, or cold water if you didn't use Chinese mushrooms. Combine everything. I always stir everything together for around 2 - 3 minutes constantly. Then cover and chill for 20 minutes. Form the Wonton Parcels. Take a small bowl and fill with cold water. This will be used to seal the wonton parcels. Take one wonton wrapper (be sure it is one only as they sometimes stick together!) and place it on the palm of your hand so when you look at it, there is a pointy side at 12 o'clock and a point at 6 o'clock, like a diamond. Use your finger, dip in the bowl of cold water, then run it along all the sides of the wrapper. Just before you use the filling, give it a good stir since it's been marinading. then use a teaspoon and place some filling in the centre of the pastry like the photo. Take the bottom point of the pastry (the 6 o'clock pointy end) and take it up to the top pointy (where my thumb is in the photo). Then seal all along the edges, making sure you get any air out. 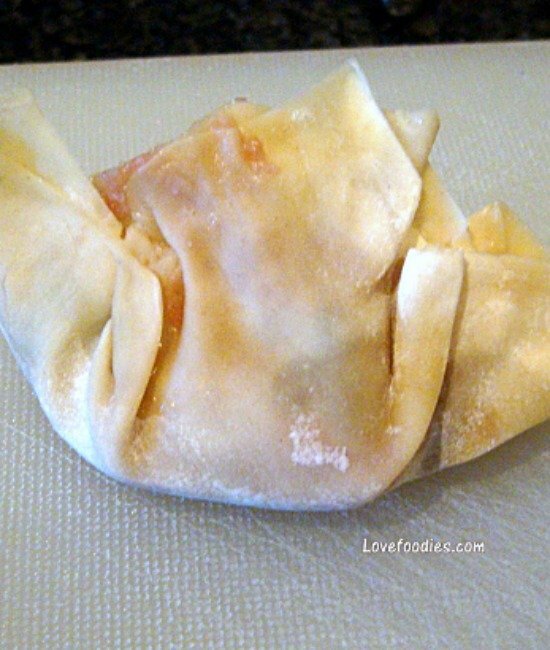 As you seal the edges, crimp a little along the way so the wonton looks like the photo below. When you have made the wonton, place on a floured surface, or chopping board like I do, and continue making them until you're done! Cooking the Wonton. 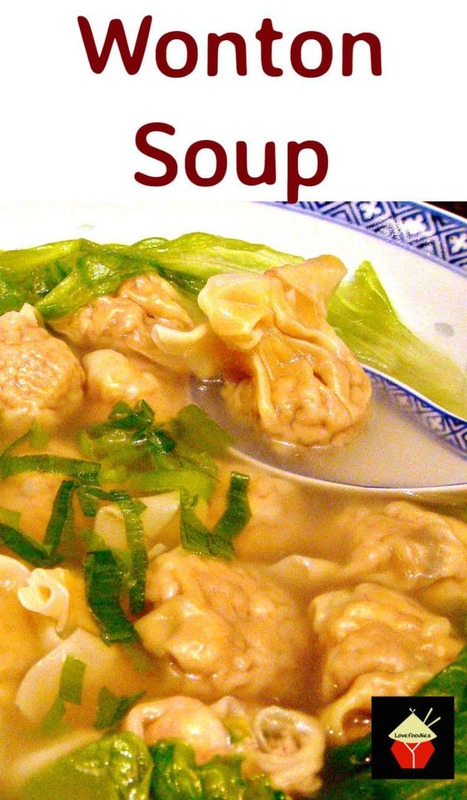 In a large pan, fill with boiling water then using a slotted spoon, place the wonton gently in the water. Try not to move them around in the water in case you break them. When they float to the top, they are cooked. Transfer them to the serving bowls. Discard the water as it will be very cloudy and starchy. Now to make the broth, simply add your chosen broth to a pan, and bring to the boil. Whilst waiting for the broth to boil, separate the Iceberg lettuce leaves. I do this my cutting the core off and running under a cold tap. The leaves come away very easy then. Add the sesame oil and a dash of soy sauce if you wish to the broth, then add the lettuce leaves. Stir everything, and you will find the leaves soften and the broth is ready. Take the lettuce out and arrange in the soup bowls, I did mine around the edge of the bowl with the wonton sitting in the middle! Use a ladle and add the broth to the wonton, sprinkle with some scallions, cilantro, if you wish and serve! I love Chinese food but I never cooked Chinese myself. Your recipe looks delicious, maybe it’s about time I try! Oh yes Delphine! You must try! I made the recipe nice and easy so you will do it perfect, and besides, you are a great cook, so I know they will come out delicious! Hi Delphine yes you must try these I have a question about your name my name is Dalphine and I was wondering if people have a problem saying your name right I have a real problem my self. These look absolutely delicious. To be honest, I would have found something like this daunting, but your directions are really good! Thank you! Hi Michelle, I’m glad you found the recipe easy to follow. Please do give them a go! Oh! One of my favorite things! I’ve yet to make them, though. Glad I found this! Glad you found the recipe Patricia, hope you get to try them soon! G’day Looks delicious! Love your step by step photos! This is one of my favorite comfort food! I can eat this every day. I wish you can make it for me, yours looks so yum! Sure, I will make some for you!!! I have wonton wrapers in my fridge right now. Thanks for this suggestion and the fact that it won’t take all day to fill them. Pinning and YUMing! Thanks very much KC, I’m so happy you like them and hope you can try them soon! Thank you for pinning and yumming too! Yes yes yes! I am sure you and your family will enjoy it! Thank you for advising to just buy the wrappers. 🙂 I’m a pastry wimp! Otherwise, I am fully on board with this recipe! Looks delicious. I say go for it Michelle, and yes, buy the wrappers, it is much easier and saves heaps of time! The wrappers you can buy are of a very good quality too, so that is why I can recommend them with out hesitation! These look so fun and yummy! I haven’t made my own wontons in ages and would love to try your recipe! Thank you very much Linda! Please let me know how you get on if you get a chance to try the recipe! This sounds so good! I even have some won ton wrappers in the fridge right now. Can’t wait to try this. Pinning for later. Thanks very much Debi! Those wonton must be calling your name!! Thank you for such a detailed recipe! I LOVE wontons but have never made my own. I’m a freezer meal fanatic, so when I saw in your directions that these yummy little bundles can be frozen, I was hooked! I will be trying this recipe this week! Hi Rosey, I’m glad you like the recipe, and yes, these are so convenient for the freezer, especially when you want to just get a few out each time! If you need any help when you make them, please do shout up here or on our Facebook page and I’ll be happy to help with anything! happy cooking and I hope you enjoy them!